The Comptroller-General of Immigration (CGI), Mr. Kwame Asuah Takyi, has expressed worry over the deplorable state of the commands and border posts in the Northern and Upper East Regional Immigration Commands, describing it as “unacceptable”. The CGI made the observation when he paid a working visit to the two regional commands of the Ghana Immigration Service (GIS) to ascertain the welfare of the personnel and their operational activities, acquaint himself with the challenges confronting them and also inspect facilities, including projects in progress. The first port of call was the Northern Regional Immigration Command (NRIC), which includes the Regional Headquarters, the Yendi Sector Command and the Tatale and Saboba border posts. The other areas were the Bunkpurugu and Wunjuga border posts. The entourage also visited the Regional Headquarters of the Upper East Regional Immigration Command (UERIC), the Bawku Sector Command and Paga and Namoo border posts. Besides, the tour took the team to the Zebilla Inland border post, the Pulimakom, Kulungugu and Mognori border posts. He was appalled by the dilapidated nature of the commands and border posts, as most of them were in ruins with no washrooms, potable water and electricity supply. Officers deployed to man these posts at the various entry points of the country use ancient chairs and tables at their various offices and had no decent lodging places either. 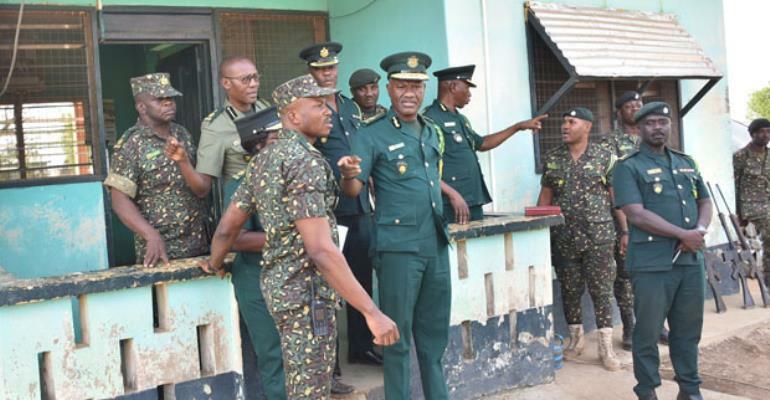 Addressing durbars of service personnel at the various commands posts, Mr. Takyi assured them of government's resolve to repair and rehabilitate the border posts. He also said efforts were being made to provide suitable accommodation for personnel. “This, I believe, will not only boost the image of the country at the entry points but also boost your morale towards your assigned duties”, he added. He, however, expressed unhappiness about the poor maintenance culture and the unconcerned attitudes exhibited by some of the commands about the deplorable state of the border posts. He was accompanied on the tour by his deputy in charge of Finance and Administration, Mrs. Judith Dzokoto-Lomoh; the Chief Staff Officer, Chief Superintendent Lawrence Agyei Agyapong; Deputy Chief Staff Officer/Aide-de-Camp to the CGI, Supt. Amoateng Enning and the Head of Public Affairs, Superintendent Michael Amoako-Atta.